Bring 1 cup of water to boil. Drizzle in 1/2 tsp olive oil. Add 1 tsp of salt and rice. Cook on medium until all the water is absorbed and the rice is cooked through. Fluff with a fork before serving. Preheat oven to 400F. Line baking sheet with aluminum foil. Place asparagus in a single layer on the baking sheet. Drizzle with olive oil and mix until all of the asparagus is coated. Sprinkle with salt and pepper and roast for 25-30 minutes until asparagus is tended and lightly browned. Rinse the scallops and pat dry. This is the most important step. Make sure your scallops are dry! If you don't, they will form steam when they hit the hot pan, and won't form a nice crispy crust. Season the scallops with salt and pepper. Once the rice and asparagus are done, heat frying pan over medium high heat. Add olive oil and butter. Once the oil is hot, add the scallops, make sure they aren't touching. Let cook for 1-1/2 minutes. Flip scallops over and allow to cook another minute. Remove from heat and serve immediately. 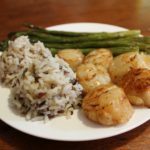 Plate 6 scallops with 1/2 cup wild rice and 1/2 of the asparagus.